Shannon Dunbabin of Cascade Yarns shares 60 Quick Knitted Toys with her personal touches on the Yarn Thing podcast with Marly Bird. The history of Cascade Yarns began in the late 1980’s. Bob Dunbabin found a location for Cascade Yarns® in a vacant storefront, in Pioneer Square, Seattle. The space was modest, squeezed between a mission for the homeless and the main north-south rail line. To Bob, the modest but logistically well located space suited the company’s needs. Best of all, it came with a good price. Bob believed that knitters cared more about the quality of the yarn, than the prestige of the office location. Bob would use the savings from the location to provide a better yarn at a better price. The real estate market in Seattle changed and Cascade Yarns® has moved 3 times, but the dedication to quality and value in the yarn remains. Cascade Yarns® remains a family business with Bob’s daughter-in-law, Shannon, joining the business in 2003 and his son, Rob, moving full time into the business in 2005. We love our yarns and we hope that you enjoy knitting with them. Find Cascade Yarns website at www.CascadeYarns.com The book is available through Amazon (with Marly’s affiliate code) at this link. Here is the link to the show notes from Shannon’s last visit, or the audio of the episode. I’m working on the Knitterati afghan and have completed block 5 just this weekend! Wonderful show today. I have all of the 60 Quick books. Love them. This new Quick knitted toys is so adorable. Lots of bunny love all around! Awesome show today. Can’t wait to get some bunny love. Love the podcasts!!! Awwwww, I want some bunny love too! I would love to knit toys from this book. It sounds like a great place to start to learn how to knit toys. All the kids and babies in my life would be showered in toys. Great podcast and interview. Thanks Marly, Shannon and Tammy. Loved the podcast. Long time crocheter-. Beginning knitter. Need some Bunny Love therapy! I really want me some bunny love!!!! That bunny on the cover just screams Bunny Love!! It’s adorable. Love some Bunny Love. Great book! What a cute bunny, so happy. Must be Bunny Love! Ive heard of cascades yarn before sinse I live in the PNW 🙂 Very Cool !! Hope to give some bunny love from this book! My granddaughter has two bunnies so she truely has bunny love. I have used cascade 220 superwash yarns and love the idea of knitting fun animals with it. Some Bunny Loves Some Bunny Sometimes and I would bunny love to win 60 Quick knitted Toys! Fun podcast today loved all the baby giggles in the background. Love a Cascade Yarn podcast! I will be checking out this book, who doesn’t love some bunny love? Enjoyed this show today. Bunny Love is adorable! Love cascade yarns too. This bunny love is one to last forever. I listen to your podcast driving to work in the mornings and then if I don’t finish like today I listen on the way home. I love to make and create knit and crochet toys. I hope to make Bunny Love. Thanks again. The bunny love toy on the cover of the book would be so cute to make for Easter. What a great show! The book is awesome and I can’t wait to find someone’s kiddo and start knitting some bunny love! I was happy to hear your chat with Shannon live. The sounds of her son in the background were better than bunny love. With Easter coming that bunny would be perfect as a project. I enjoyed your conversation with Shannon, especially hearing her little guy in the background. The picture of “bunny love” on the cover of her new book is adorable – especially the little carrots. I haven’t knitted toys yet; this book would provide me with lots of inspiration to do so. Thanks for all your podcasts, Marly – I’m smiling and laughing along with you! I just started my third blanket from the 60 Quick Baby Blankets. It will be for my fourth grandchild. I’m sure she will be feeling some bunny love if I win this amazing prize package! Thanks Marly for another great show. Love the podcast! Easter is a time for bunny love! Loved the podcast! It sure would be great to share the Bunny Love with my two grandsons. Cascade 220 Superwash is my favorite yarn to knit things for children. Would love to try some toys, especially the bunny love. Thanks for sharing the new book with us. I love the cute bunny on the front cover. I have started making little toys for my boys. Thanks for the chance to win!!! Bunny love makes a cute cover – but I want to knit the VW van first. I collect the series of 60 things ………. 60 Quick knitted toys has to be on my bookshelf – one way or another. My favorit things to knit or crochet are things, clothes, toys and blankets for baby and children up to 4 years old. Bunny love on the cover is so cute! I will FIND a small child to knit these for, even though my own kids have grown well past these adorable toys! The bunny on the cover screams bunny love! The 60 Quick Knit books are great. I love me some Bunny Love, to adorable!!! Great interview ladies, keep up the good work. The first thing I knitted for my only grandchild was a small bunny. I love knitting toys for young children. Bunny love is the best. I could use some bunny love!! I also would love to make toys for my 2 nieces and 3 nephews. The bunny love on the cover of the book has sold me! I loved hearing about the Cascade Yarns family business (including input from its youngest family member!). Thank you for another excellent episode and for the chance to win this very generous prize! Love “bunny love”! I have some little girls that would love bunny love! I bunny love this episode! This book looks adorable. I love the bunny on the cover. I would love to get this book and spread the bunny love! My son would love some bunny love. As always, a great podcast =) Keep them coming. Such cute knitted toys, can’t wait to try them. Oh sweet sweet bunny love!! Loved the show, and what an awesome prize!! Good luck to all!! Great podcast with Shannon! The book looks wonderful & would love to make Bunny Love! Bunny love is so fun. It flashed a memory back to when my son showed rabbits when he was in 4-H. Great interview. I plan on making this afghan and my favorite show yarn is the Heritage prints!!! There’s going to be a new baby in our extended family and this book would be perfect to show him/her some bunny love. I’m going to check it out! The bunny toy on the cover would be a great gift for someone in need of some bunny love! Great podcast and hooray for BUNNY LOVE!!! With all the new grand nieces and nephews in my family, I’d love to spread some Bunny Love! Love your podcasts! Would love to knit some BunnyLove toys for mr adorable Grandbabies! Keep up the good work Miss Marly! You are Awesome!!! I normally crochet my animals. I would love to start knitting up some bunny love though! Perfect timing for bunny love for my new grand baby. THANK YOU LADIES! I can’t make a toy without my kids trying to steal it! I might need some bunny love though. Too cute! With a toddler and a second baby on the way I need some bunny love to share with my little ones. I could use some bunny love from this book. It’s on my to buy list! 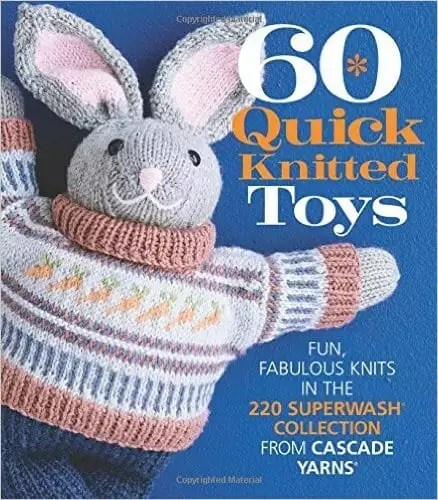 The cover of 60 Quick Knitted Toys has the cutest bunny on it, fills me with bunny love! Oh my goodness! That little sweater with carrots! Spring time is exactly when we need more bunny love! Thanks for doing the interview!